Born on 5 January 1889, Joseph Force Crater’s childhood ambition was to be a judge. Having qualified at Columbia Law School in 1916 he joined a Manhattan law firm where his colleagues believed he was on his way to a seat on the United States Supreme Court. Crater worked on all the cases that other lawyers shunned, writing intricate briefs. On 16 March 1917 he married Stella Wheeler whose divorce he had negotiated exactly a week earlier. In 1920 he became secretary to Judge Robert Wagner of the New York Supreme Court. By 1927 Crater was earning $75,000 a year and he bought a luxury flat at 40 Fifth Avenue and a summer estate at Belgrade Lakes, Maine. Although a womanizer, Crater had a main girlfriend, an ex-model called Constance Marcus for whom he had acted in her divorce. He paid part of her rent and gave her money to run a dress shop. To finance his lifestyle Crater became involved in dodgy deals. In 1930 he lobbied to replace the retiring New York Supreme Court Justice Joseph M. Proskauer, despite the fact that he would have to take a 75 per cent drop in salary. He used every contact he had, including his mistress, and Governor Franklin D. Roosevelt appointed Crater on 8 April. Crater looked forward to the November election and confirmation of the 14-year post with a possible eye on the United States Supreme Court. Political opponents began digging into some of the deals brokered by Crater. He and his wife travelled to their summer home in June. He then returned to New York on 1 August to meet his mentor Robert Wagner. Back in Maine, he received a phone call on 3 August and told his wife he had to return to Manhattan but promised to be back in time for her birthday on 9 August. By 11am on 6 August he was working hard in his office. He sent a minion to the bank for $5,150. At lunchtime he left the office, with the money and bundles of important files. At 8pm he went to Billy Haas’s restaurant at 332 West 45th Street for dinner. At 9.15pm he jumped in a taxi for a trip to the theatre. Judge Crater was never seen again. His disappearance, one of the most famous in American history, earned him the title “The missingest man in New York”. The City of New York offered a $5,000 reward for information. 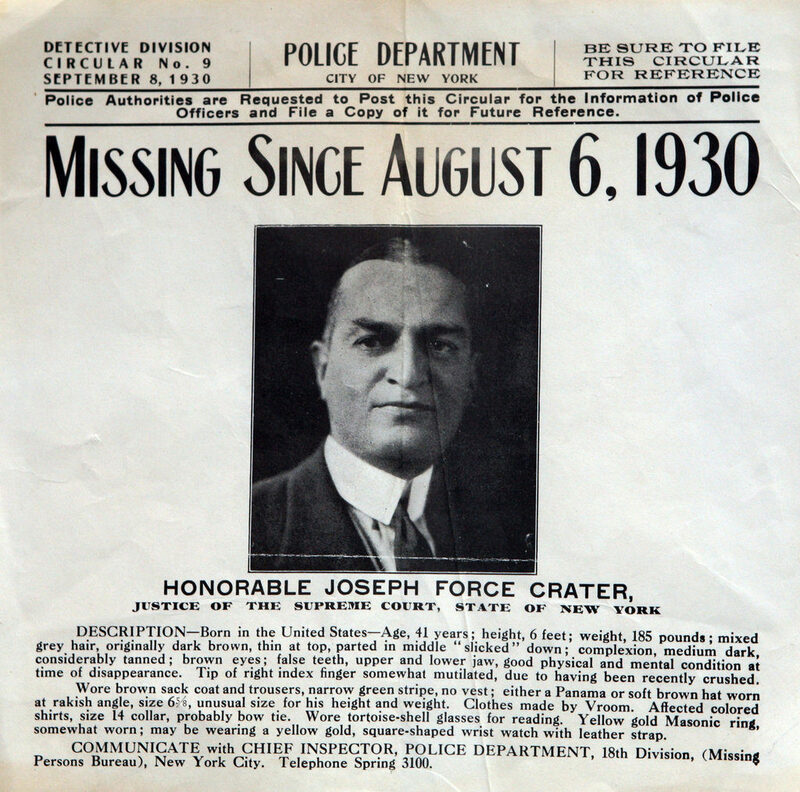 Judge Crater was declared legally dead on 6 July 1939. In 1985 the New York Police Department officially closed the case. In 2005 a woman died, leaving a note claiming that her late husband, a policeman, and his cab driving brother-in-law were responsible for Crater’s death and his corpse was buried on Coney Island beneath what is now the New York Aquarium. Crater had two vices – fashion and women – and although one was obvious, he took pains to keep his extra-marital life a secret.